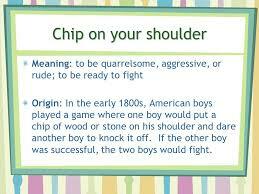 Definition of have a chip on one’s shoulder informal : to have an angry or unpleasant attitude or way of behaving caused by a belief that one has been treated unfairly in the past He has had a chip on his shoulder ever since he didn’t get the promotion he was expecting. United States is prepared to escalate economic, diplomatic and political pressure on China, Pence said. He believes the U.S. economy is strong enough to weather such an escalation while the Chinese economy is less durable.